THE SHOWBIZ LION: HIGHLANDER: A HOMECOMING FOR CHRISTOPHER LAMBERT, SEAN CONNERY AND CLANCY BROWN? HIGHLANDER: A HOMECOMING FOR CHRISTOPHER LAMBERT, SEAN CONNERY AND CLANCY BROWN? COULD Christopher Lambert and Sean Connery be returning to Scotland along with the rest of the cast of Highlander? 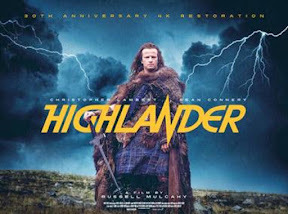 The Edinburgh International Film Festival has just announce that a special 30th anniversary screening of the newly 4K restored HIghlander, with special guests in attendance, will take place on Saturday June 18 2016, as part of the celebrations marking EIFF’s milestone 70th edition. The cult favourite and one of the great action-fantasy romps of the 1980s, is packed with quotable lines, stylish sword-fighting moments and a memorable soundtrack from Queen. The story has its dramatic origins in the 16th century Scottish Highlands where Connor MacLeod (Christophe Lambert) first discovers he is not like other men. After doing battle with a rival clan he is stabbed by a strange mercenary fighter called the Kurgan (Clancy Brown), but finds that he cannot die. Befriended and trained by the charismatic Juan Sanchez Villa-Lobos Ramirez (Sean Connery), he finds out he is part of a group of immortals who must do battle until there is only one left alive. Clancy Brown is acclaimed as a cult icon thanks to his mesmeric and maniacal performance as the Kurgan whilst Christophe Lambert is soulful and heroic as Connor, and Sean Connery quite sublime as the foppish yet skilful Ramirez. Clancy Brown commented: “It’s taken a while, but I swore to myself that I would return again to Scotland after filming Highlander 30 years ago where I first learned of Robert the Bruce, James Macpherson, The Fortingall Yew and, most blissfully, single-malt scotch whisky." Clancy and other special guests will be in attendance at the screening on Saturday June 18 at Cineworld, Fountain Park. The film will be released on DVD and Blu-Ray on 11th July complete with brand new bonus material.